If you follow the BW team’s work, you know we love statement ceilings! If you follow the BW team’s work, you know we love statement ceilings! Whether it’s applying a bold accent paint color or hanging a wallcovering on the ceiling it’s sure to draw your eye up. As opposed to popular belief, it can actually make the room seem taller rather than squatty. Sound a little daunting? Try a smaller space like a hallway or bathroom first before considering large living spaces. Just make sure your lighting game is on point! Nobody wants to look at a wonky ceiling fan on a freshly dolled up ceiling. **Designer tip: We LOVE a geometric print wallcovering on the ceiling. When the runway meets the home we welcome fringe! We all know this is no new trend, but it is certainly reemerging in new light. It’s not the deadpan traditional burgundy and gold fringe on your grandmother’s pillows—we promise! Think Elvis meets the roaring 20s. 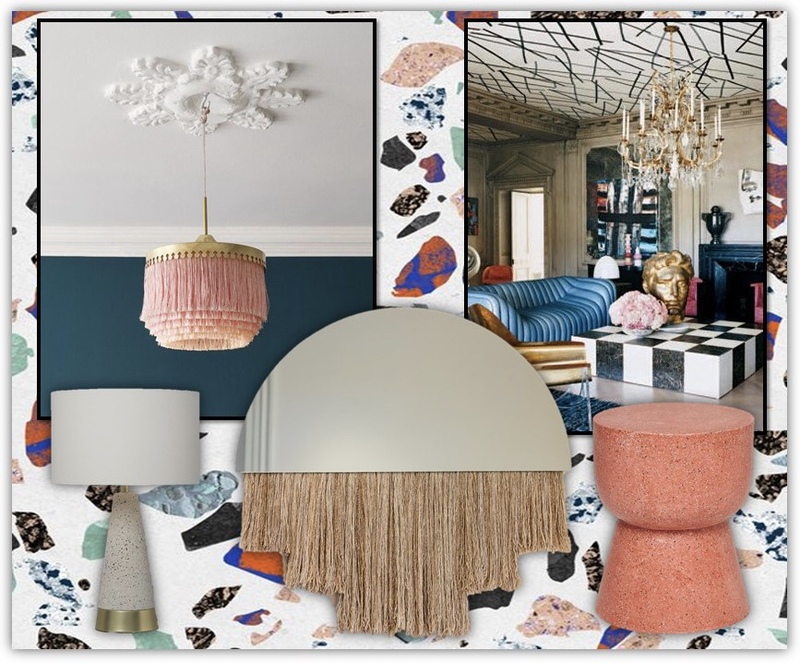 Chandeliers, sofa skirts, and even mirrors are being adorned with colorful and delicate fringe on trend with the “more is more” movement. Adding a touch of bouillon fringe to a lackluster upholstery piece creates interest without being gaudy. **Designer tip: Try pairing a pastel fringe chandelier with a saturated blue or teal wall hue for a major statement with a minor dollar sign. I can hear my parents groaning now! The ever dowdy terrazzo trend is BACK and I could not be more excited. You probably remember this stuff from every government building from the 70s. It’s a very hard stone-like material that incorporates chunks of marble, quartz granite or even glass set in concrete or resin and polished to perfection. The stone chips can be small or quite large and now come in a myriad of colorways, which makes the design possibilities endless. Coffee tables, floors, walls, backsplashes, countertops and on and on are being tattooed in terrazzo with the advancement in engineering. This retro trend is sure to reinvigorate and bring liveliness into your home this spring. We don’t see this one going away for a while! **Designer tip: Opt for a three color terrazzo floors rather than tile in your kitchen for a splash of color.